BAAFF is back for an bonus mini-series. 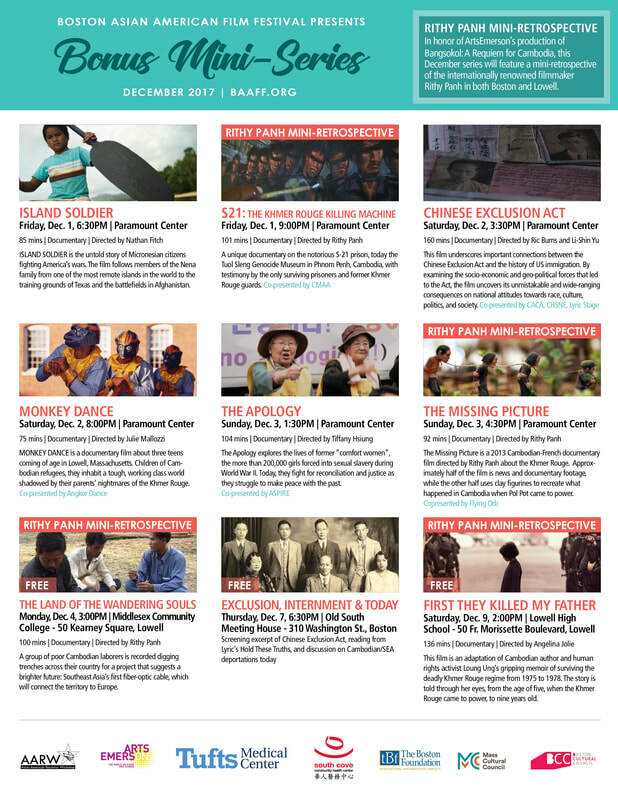 Join us December 1-9 to experience compelling documentaries while supporting the local Asian American community--especially our network in Lowell! In honor of ArtsEmerson's production of Bangsokol: A Requiem for Cambodia - DEC 19 - 20, this December series will feature a mini-retrospective of the internationally renowned filmmaker Rithy Panh in both Boston and Lowell. We will also celebrate the 30th anniversary of the Angkor Dance Troupe with a screening of the The Monkey Dance with a special follow up piece on where the dancers are now. ISLAND SOLDIER is the untold story of Micronesian citizens fighting America's wars. The film follows members of the Nena family from one of the most remote islands in the world to the training grounds of Texas and the battlefields in Afghanistan. It is an emotional gathering of two families, from opposite sides of the world, brought together by loss, love and honor. A remote archipelago of hundreds of tiny volcanic islands in the western Pacific, The Federated States of Micronesia (FSM) is an independent nation of 100,000 citizens, and a protectorate of the United States. In recent years, the country has become a “recruiter’s paradise” for the U.S. military, especially since 9/11. Yet they have lost fives times more soldiers, per capita, than any U.S. state. The film captures a tightly knit island community — a microcosm of economic, social and political change, as the high price for military service in a foreign nation’s wars cuts deep. Join us for AARW's annual meeting. Come learn more about our parent organizations, AARW's, work last year and their upcoming plans for 2018 whether you're a longtime member or just learning about the organization! At this meeting, members will also be voting in new AARW board members, and will participate in an activity to capture AARW's mission, vision, values! If you would like more information and/or have any questions, please feel free to reach out to kevin@aarw.org. This film underscores important connections between the Chinese Exclusion Act and the history of US immigration. By examining the socio-economic and geo-political forces that led to the Act, the film uncovers its unmistakable and wide-ranging consequences on national attitudes towards race, culture, politics, and society. Q&A with director Julie Mallozzi and subject. MONKEY DANCE is a documentary film about three teens coming of age in Lowell, Massachusetts. Children of Cambodian refugees, they inhabit a tough, working class world shadowed by their parents' nightmares of the Khmer Rouge. Traditional Cambodian dance links them to their parents' culture, but fast cars, hip consumerism, and good times often pull harder. For the parents, Lowell held the hope of safety, employment, and a chance to finally rebuild some of what was shattered by the Khmer Rouge. But for their children, the city offers a dizzying array of choices - many of them risky. Monkey Dance is the story of how three kids navigate the confusing landscape of urban adolescence and ultimately start to make good on their parents' dreams. Original film plus 10 minute “Where are they now” follow up. The Apology explores the lives of former "comfort women", the more than 200,000 girls forced into sexual slavery during World War II. Today, they fight for reconciliation and justice as they struggle to make peace with the past. Some 70 years after their imprisonment in so-called "comfort stations", the three "grandmothers-Grandma Gil in South Korea, Grandma Cao in China, and Grandma Adela in the Philippines-face their twilight years in fading health. Whether they are seeking a formal apology from the Japanese government or summoning the courage to finally share their secret with loved ones, their resolve moves them forward as they seize this last chance to set future generations on a course for reconciliation, healing, and justice. The Missing Picture is a 2013 Cambodian-French documentary film directed by Rithy Panh about the Khmer Rouge. The film was the Cambodian entry for the Best Foreign Language Film at the 86th Academy Awards and was nominated. Approximately half of the film is news and documentary footage, while the other half uses clay figurines to recreate what happened in Cambodia when Pol Pot came to power. by Flying Orb Productions precedes screening. CPK Wedding Ceremony, Cambodia 1977 was conceived after reading a 2016 New York Times story about the United Nations-backed tribunal investigating the crimes of the Khmer Rouge including thousands of forced marriage ceremonies between 1975 and 1979. Many Cambodian women and men were telling their story for the first time. In the words of one woman identified only as 2-TCCP-274 to protect her identity, "...who could I tell? If I told anyone, I would be dead. Nobody could help me." A group of poor Cambodian laborers is recorded digging trenches across their country for a project that suggests a brighter future: Southeast Asia's first fiber-optic cable, which will connect the territory to Europe. But as the job stretches on for months, it becomes clear that the workers cannot escape their country's war-torn, Khmer Rouge past -- as they dig, they uncover human remains and old land mines. It's also doubtful whether they can break free from their exhausting, destitute reality. What does a little-known 1882 law have to do with American identity, democracy, and civil rights today? Through powerful and illuminating visuals, historical documents, testimonies and insights of leading scholars and experts, The Chinese Exclusion Act documentary explores the history of Chinese immigration to the United States and its significance to issues of globalization, immigration, labor and civil rights today. 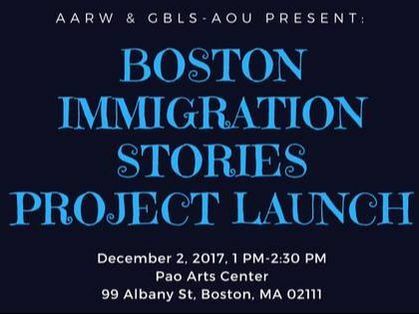 On the eve of Pearl Harbor Day, come see an excerpt from The Chinese Exclusion Act and engage in a discussion about The Chinese Exclusion Act and it’s impact on immigration history through today. Panelists still to be announced. First They Killed My Father is the adaptation of Cambodian author and human rights activist Loung Ung’s gripping memoir of surviving the deadly Khmer Rouge regime from 1975 to 1978. The story is told through her eyes, from the age of five, when the Khmer Rouge came to power, to nine years old. The film depicts the indomitable spirit and devotion of Loung and her family as they struggle to stay together during the Khmer Rouge years. The film was shot on location in Cambodia, between November 2015 and February 2016. It was filmed entirely in the Khmer language, and is the largest movie ever made in the country. The cast is made up entirely of Cambodian actors. Cambodian technicians, artisans and crafts people comprised the largest portion of the crew, along with more than 3,500 Cambodian background actors.